The best time to sow your adenium seeds is in spring. Having said this, however, don't let anyone tell you that you can not winter sow because you can. But you should not do this unless you know you will be able to provide adequate light and warmth throughout the cold season. Otherwise, you're just asking for avoidable aggravation. This article is about winter sowing adenium seeds, yeah? You will need a spot to incubate the seeds as well as to grow them during winter. This is a lantern that has been retrofitted with high-output fluorescent bulbs. There are various online sellers of adenium seeds. Most of them would show you pictures of what the flowers are supposed to look like someday. This became a factor for me only because I really would rather not have pink. But I have since learned from the experience of others that the odds of you getting what is advertised are close to only 20 percent, if you are lucky. Parent plants have to be hand-pollinated in order for the resulting seeds to carry the desired traits. No clue about the odds of that being successful, even if the plants are isolated from other specimens. Having said that, when I bought my seeds on Ebay, I still made my choices based on what flowers the grower was trying to come up with. So I ordered seeds that are someday supposed to bloom red so dark, it will be almost black. We can hope. Most seed suppliers that I found are outside the US and the ones most favored by the Adenium Hivemind are in Taiwan and Thailand. They will ship internationally and take care of the necessary phytosanitary certificate for you if you are ordering for your own use. I don’t know what the volume threshold is but if you are buying more than that, you will probably need an import permit; in which case, you’re on your own. Phytosanitary certificates, we have to assume, are issued to exporters of plant materials after they have met certain criteria ensuring that their stuff are not carrying some horrible disease that could kill off agricultural crops and destroy civilization as we know it. If you are looking around for Adenium obesum seeds, I suggest you also check out Adenium arabicum—these are even funkier vegetables and some of them supposedly grow really fast. In this little how-to, I am only going to cover obesum and arabicum because they are what I have tried so far. I have no interest in the others. If you got your seeds from someone who knows exactly how fresh it is, you will not have to do any seed preparation. If you bought your seeds and have no way of knowing how old it is, you will have to soak your seeds in warm to tepid water for 2 to 6 hours. Commercial growers usually dry out their seeds to prevent mould developing if they are not to be planted immediately after harvest. Sometimes, the seeds are just old and umphless. You will have to revivify them. Successful germination depends largely on the age of the seeds but your odds are improved if you pre-soak them before sowing. 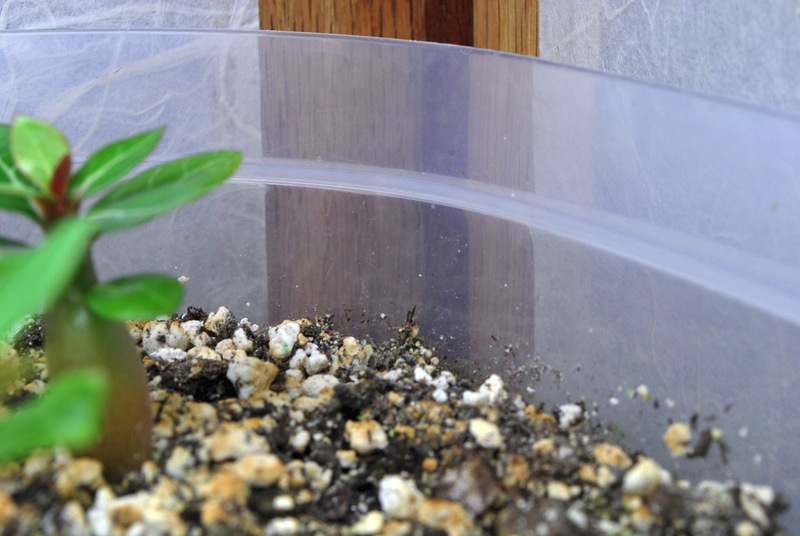 So unless you got your adenium seeds fresh from the womb of an adenium seed pod, you should not skip this step. I have to mention this twice because I did get lazy on my second try and was able to germinate only 3 out of 10 seeds. Also my own sister somehow managed to ignore this one instruction and had to exhume her seeds after having just sowed them. So again: if you have no way of knowing whether your seeds are fresh or not, you have to soak it in warm to tepid water for 2 to 6 hours. As adult plants, adeniums thrive better in very airy mix—mine are planted in a similar mix that I use for my haworthias, consisting mainly of pumice and about 5 percent peat moss or potting soil, whichever I have available. But to germinate adenium seeds, you want something with more soil that drains well but holds a bit more moisture. I have successfully used just normal potting soil mixed with about 25 percent perlite. Catus mix will work too but I think even that is too heavy. If I used that, I probably would still add perlite to it. This early in their development, the seeds and the emerging seedlings require to be consistently moist. You should prepare enough potting medium to fill your container because your seedlings will be staying in it for at least 60 days or more. What you want is something at least 3 inches deep with drain holes. Unlike, say, coleus, adenium seedlings will be staying in that container longer and will need more room to grow roots. The first time I sowed adenium seeds, I used a Tupperware container. I drilled three drain holes at the bottom and covered that with a piece of screen so stuff doesn't fall out. My pilot seedlings are still in there so the second time I sowed adenium seeds, I decided to use a salad box. You can get one of those high-tech, special-purpose seedling thingies if you want. I personally think they are not deep enough. Salad boxes are good. They are the right depth, they fit the spot I want to put the seedlings on while they are growing and they come with their own lid. I cut about half-inch holes at the bottom and air holes on the lid. Not to be obsessive (right) but I also put appropriately-sized screens on the airholes to keep bugs from getting in. You can use any other pot or container that you have, just make sure they have drain holes and prepare a transparent lid for them. With holes. When these seeds were planted, the soil was up to that line on the container. But now it has settled a bit. If this container was opaque, there will be that much shade on the seedlings. Just something to keep in mind. Things are handled a bit differently in the tropics. But anywhere there are seasons, you will have to consider your light source and the temperature. Adenium seeds need temperatures between 25C and 35C to germinate. It makes obvious sense to sow your seeds in the summer but I don't care about obvious. I wanted my plants to already have a presentable caudex by December so I sowed in the dead of winter (January and February). There is no way I can heat up my room to the level that these seeds needed to germinate. So, after a little research, I opted to get a thing called a propagation mat. It’s basically a heated pad with enough juice to warm up your soil. I bought mine from Amazon and from the product reviews, I actually found a wealth of information on how to germinate seeds, in general. First of all, you want some insulation between your surface and the propagation mat: Otherwise, most of the heat would just transfer to the table, shelf and whatnot. You want to block that transfer so the heat goes up instead. I used one of those stiff half-inch Styrofoam things. My room is heated up to 20C during the day and to 16C at night. In this set-up, I’ve measured the surface temperature of the soil going down to as low as 25C and going up to as high as 36C. I decided peaking at 36C was probably too much for the seeds so I propped up the container on the closest objects I had---a bunch of river stones I had used to topdress another pot nearby. This creates some air movement between the heat source and the container. Light is the other important thing. Without going heavily into photometrics, let me just say this—plants need different kinds of light conditions for their specific survival strategy. Think of the sun as a buffet table, serving every conceivable dish from every conceivable cuisine. Plants take what they need. As far as I can tell from my research, your artificial lighting set-up depends entirely on what kind of plant you are growing and how sensitive it is to the kind and amount of light you provide. You will not believe the amount of detail enthusiastic growers go into to be able to grow impossible things in impossible places. In the end, I decided my adenium seedlings will be grown under two 17-watt T5 High Output fluorescent bulbs—nice little things, they don’t waste so much of their energy generating heat instead of light. The container is positioned about 4 inches away from the bulbs—it provides them with as much light as a 17-watt T5 bulb can give without scorching. I’m sure they could all use more light than I am providing. They will get more when it’s warm enough to put them outside. In the meantime, they appear to be satisfied and I am not willing to go through conniptions to give them heaven, you know? Because then it will be work, not fun. In short, do whatever works for you. My low-power, high-output arrangement works fine for me. Prepare one cup of chamomile tea and let it cool. This is a mild anti-fungal solution. Moisten your potting soil with this brew—just enough so it is wet but not soggy. Fill your container with the moist potting material all the way to the top, leaving about half an inch to an inch of space from the rim. If your container is opaque, sowing the seeds too low will put it in the shade part of the day and your seedlings will develop the tortured look as they stretch out towards the light, something known as etiolation. Not pretty. Put the seeds down on their sides, about 2 inches apart to give them enough room for growth. Cover the seeds with about an eighth inch of your potting mixture or, better yet, dry sand. Remember: DO NOT BURY. Just sort of cover them up a bit so they are not exposed. That's about an eighth of an inch of soil. 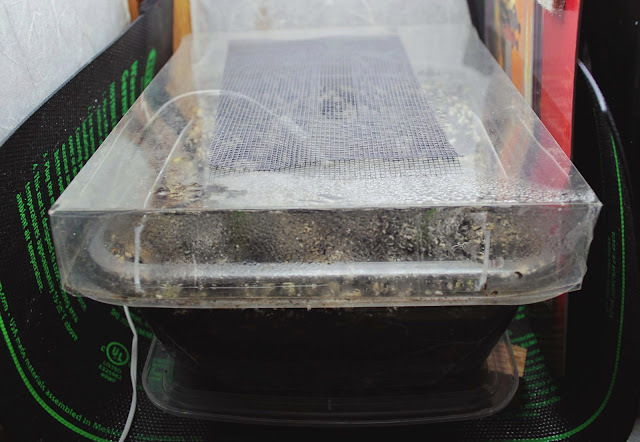 Put the container on the propagation mat and cover with a transparent lid—you can use cling plastic, just poke several holes in to provide some airflow while also keeping humidity high. The only problem with using cling plastic is you can’t as easily lift it when you need to mist the seedlings. You may need to mist the surface every day. Watch that it doesn’t dry out. Here's mine, Adenium arabicum incubating. No need. This debate happens waaaay later, after the plant has been moved out of their first or even second pots. There are two distinct schools of thought about growing hard and growing fast. What I can glean from these discussions so far is that it seems to boil down to a matter of aesthetic preference. More on this later. In any case, you're done sowing. Now, twiddle your thumbs. Sowing adenium seeds in summer is a considerably simpler matter. Once night temperature reaches an average of about 20C, you can sow adenium the same way except you would not need the heating mat. Put your seedling tray in bright shade, however, not direct sun. Make sure the surface is moist. I covered my container with that lid you see above, mainly because I did not want to have to bother with bugs. How hardy is the bangkok kalachuchi? Can it survive in the hardy zone 6-8? Definitely not outdoors. You'll have to bring them inside in winter. You'll have to be in the tropics to be able to keep them outside all year.